Welcome! to St. Paul Lutheran Church. We are a member of The Lutheran Church - Missouri Synod, which was formed in 1847. Our pastor is Rev. Walter Keller, a 1981 graduate of Concordia Seminary, St. Louis, MO. 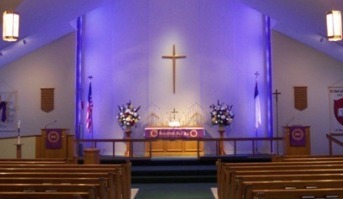 St. Paul Lutheran is located at 42681 Hayes Road, (just south of 19 Mile Road), Sterling Heights, MI 48313. You may contact us by email at stpaulsterlingheights@yahoo.com or by phone at (586) 247-4645. Please join us for worship and let us know how we can be of further assistance to you! Click for a map to St. Paul Lutheran. Holy Communion is celebrated in both services on the 2nd & 4th Sunday of each month. Nursery/Cry Room available for parents and children during worship services if needed.